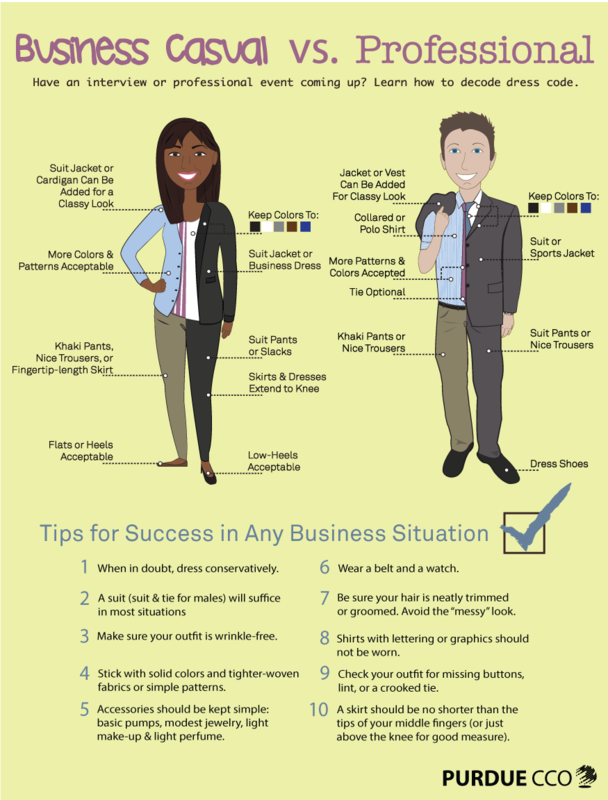 Knowing what to wear in business or professional situations can be hard. Here are some pointers on the differences between business casual and professional to help you wear what’s appropriate. If you do have any questions about what’s appropriate dress for an event or interview you have coming up, feel free to Drop-In the CCO during walk-in hours, Monday-Friday 10am-4pm, or you can make an appointment in Young 132. Excellent overview! We recently had a college graduate show up for an interview wearing a hoodie. Since obviously no one had mentored him, I did point out gently that it wasn’t appropriate. I hope that helps him on his next interview! Love the graphic! It’s too bad patterned suits are a no go for the office. We love the new styles that come out all of the time, but it is possible to look great in a solid patterned suit as long as the rest of your outfit is well put together. Such as the tie, pocket square and dress shirt. Professional design of clothing are make by professional dress designer I have read this blog that is nice please follow us :- The most important thing about the working nature as well as necessary points can give you things to learn about Women’s Fashionable Clothing Online the online buying process. There are some amazing Hilton Head Boutique new options as well as facilities all coming up which will be surely making way for all new things and accordingly users can buy things of choice at ease.